The peppered moth managed to change it's wing color in accordance with its grimy environment and researchers have pinpointed how this happened. What does a the peppered moth, usually found in England, have in common with a tropical butterfly? By looking at them, not much but scientists have found a gene that both species possess and it’s to do with the ability to change the coloring on their wings. 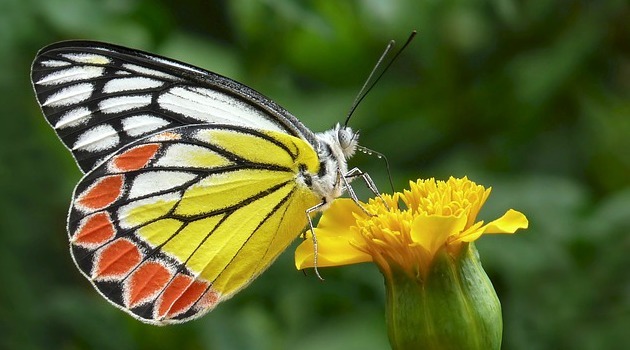 Researchers have found that the colorful patterning that tropical species of butterfly use to mimic their illustrious surroundings has been also found in the species of British moth. The peppered moth turned from a light peppered color to black during the industrial revolution back in the beginning of 19th century Victorian England to blend in with the soot and grime commonly found at that time. According to a BBC report, the introduction of clean air laws in the 1960s resulted in the peppered moths regaining their original lighter characteristics. The gene responsible for this is called cortex and is thought to contribute to cell division in the wings of the insects but it is unknown why this affects color in particular. Chris Jiggins, Professor of Evolutionary Biology from the University of Cambridge explains the questions that this new research pose. The team genetically mapped both the black and paler moths to find genetic differences between the two and found 87 DNA anomalies. Further research found a mutation that was a piece of DNA called a transposon that had inserted itself into the cortex gene. But the researchers don’t know why this causes the change in color. Analysis of this genetic cause in the peppered moth’s wing color was published in the journal Nature.